With the barest of rumors that Half-Life 3 might exist someday in the near future (a semi-annual occurrence for those of us still looking for it), I started to wonder why we've never seen a Half-Life movie or show. Surely there's more of a built-in audience and a fountain of narrative material for Valve's once-flagship franchise than for some of the other gaming properties that have crossed over into Hollywood territory... glaring at you over there, Need For Speed. I have thought for years that Half-Life might do better as a short-run TV series, perhaps ten episodes per season. The games always felt episodic even before they became so literally, due to the big set-piece moments and distinct environment changes in between chapters. In tone, it would fall somewhere in between "The Walking Dead" and the CW's slew of DC comics shows, what with the relentless amount of danger and hopelessness mixing with a distinct mythology and iconography being adapted for newcomers. 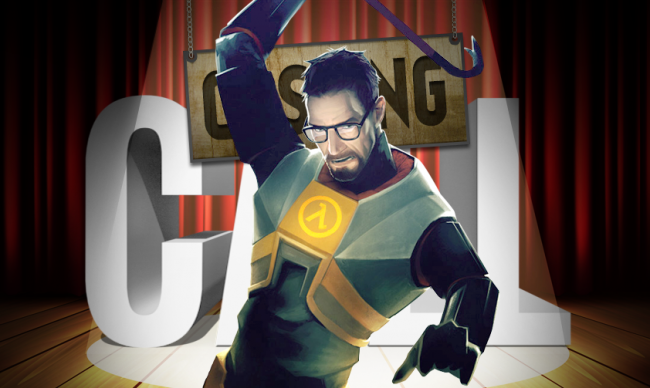 But the obvious question is who would play that bastion of human survival, Dr. Gordon Freeman? Naturally, he probably couldn't remain silent through the run of a show or movie. I know that disappoints fans, but it's just not possible for the lead character to be mute. So Gordon's personality should be extrapolated from the NPC reactions to the player: Gordon is curious to an almost-hazardous extent. He's bookish, but deceptively rugged and resourceful. And though he's probably more at home in a lab coat jotting down figures, he cuts an impressive figure in that orange hazard suit. Oh, and according to in-game exposition he's supposed to be 27 years old, but I think we can all agree that this should be negotiable. The intelligence of a particle physics professor, the physicality of a crowbar-wielding resistance leader, and perhaps the ability to play a haunted survivor of a massive accidental massacre (if we get past the events of the first game). Norton has all of this. He's a bit older than the character, but he's also one of those Hollywood folks who can age up or down to an extent. As we've seen in the 2008 Incredible Hulk as well as American History X, Norton can transform. That's not a bad joke about Bruce Banner; I'm saying that Norton can play a character through different prisms and show us how a person changes after extraordinary circumstances. Hence, as Freeman we can watch a timid MIT graduate become the most lethal alien-killer since Duke Nukem and it would seem believable. Realistically, I don't think Norton would do a video game movie. After his "disagreements" with Marvel Studios and his notable struggle with Paramount over a multi-film contract, it's likely he'd never sign on for anything involving sequels. But fans of his work like me can certainly dream.